Spent four days in Esquel. Wow. Never thought it was possible to be so bored - and I went there with 3 fresh books! After Bariloche, Esquel is nothing special. Surrounded by mountains but they are dusty rather than the pretty green, snowy ones of Bariloche. Went on La Trochita my first day there. 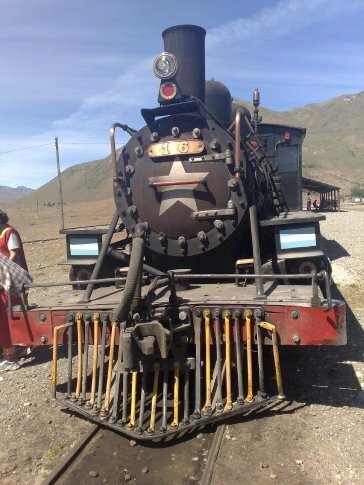 It is an old steam engine that runs on very thin gauge tracks. Just did the tourist run which is bout an hour each way to this place literally in the middle of nowhere. There are four cottages there that are used as bathrooms and places to sell food and trinkets to tourists and that´s all that´s there. The steam train was kinda cool though. It has woodstoves in the centre of each carraige for heat in the winter. The hostel was still being finished - reminded me of Da´s houses! Each day you were woken up early by the noise of carpentry or banging. Touching off walls was a no-no too as they were painting in patches. Every other traveller there seemed to be in couples but unusually for a hostel they stook together and weren´t friendly. Probably had 4 hours conversation my whole time there and most of that was with an American who had arrived the evening that I was leaving! The only thing around Esquel of interest is the national Parque de los alerces but the buses only leave on certain days to go there. Also, the bus south only goes once a week so I decided to get the hell out of there rather than see the park and be stuck there for an extra week! Left Esquel at 2.30am on a bus that Bus Eireann might have had in the 70´s or something. Worst bus I have seen since I have been here and was annoyed cos it was on the longest journey I have made yet. Luckily we changed buses the next day at lunchtime onto a more modern one although the seats still only reclined slightly. The bad news was that the new bus had no toilet. Don´t know what they are thinking. Did I mention that we were travelling on Ruta 40 - which is basically a dirt road. The bumps were extremely unpleasant. There was a battle over the land bordering Chile which they call the desert battle - I can understand why...the scenery we went through was basically clumps of grass with clay that looked like sand between them. From a distance it looked like lumpy browny-green porridge. Esquel sounds like an adventure to me. Too bad you didn't see it that way. You should have stayed in Bariloche with the rest of the tourists.